The patients below were severely ill and failed intensive psychopharmacological treatment for their depression from multiple doctors. All of them have achieved a full remission from their depression. After completing a taper of TMS treatment, all of the patients remain in remission upon follow up assessments of up to a year after treatment. A 63 year-old male who had chronic depression for over 30 years. He had tried and failed dozens of antidepressant medications and combinations thereof. His depression was the most debilitating during the five years prior to TMS treatment. He went into remission with a 20 point drop in BDI II, from 26 to 6. He also reported secondary improvements in short and long term memory, a common beneficial side effect with this type of TMS treatment. 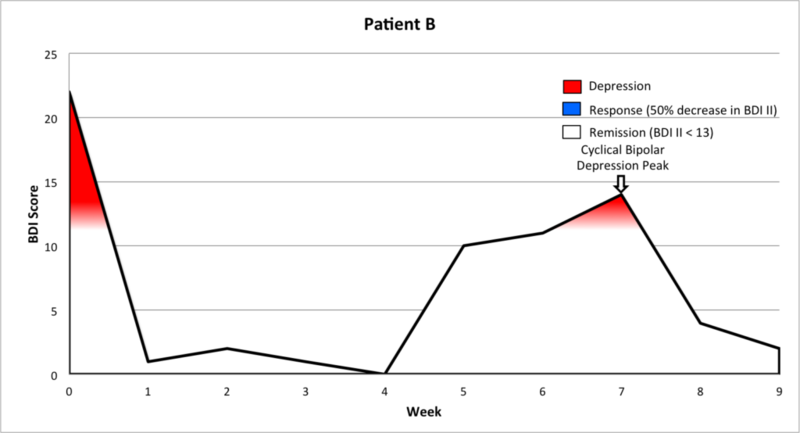 A 65 year-old female who suffered from debilitating cyclical bipolar depression for more than 20 years that severely impaired her social and vocational functioning. After failing multiple medication trials, she came to Dr. Stubbeman for TMS treatment. The bipolar depression, and not the TMS treatment, contributed to the fluctuation seen as a second depression peak during her treatment. She reached full remission from her depressive symptoms after completing treatment and has maintained remission at her last 9-month follow-up assessment. Patient now functions normally and has been able to taper off of most of her psychotropic medications. 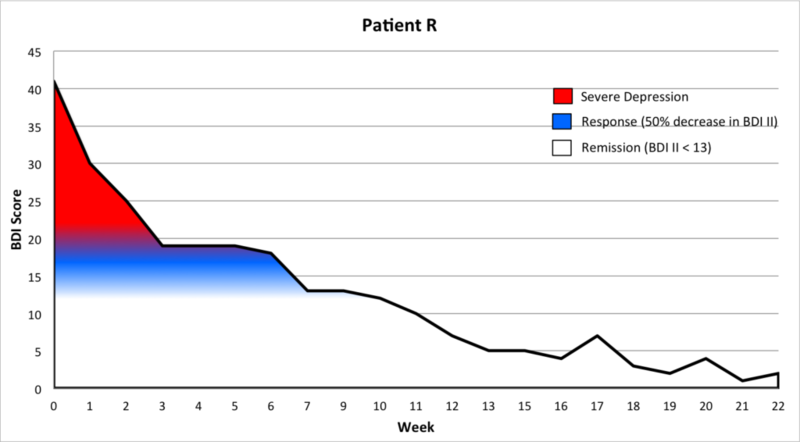 A 23 year-old male who suffered with severe treatment refractory depression for five years, failing dozens of medication trials. At the start of treatment, BDI II was 31. His score decreased by 25 points to 6 by the completion of treatment. A 22 year old male who reported that he had been depressed his whole life, officially diagnosed at 16. He previously tried numerous medication combinations, but none were able to lift his depression. 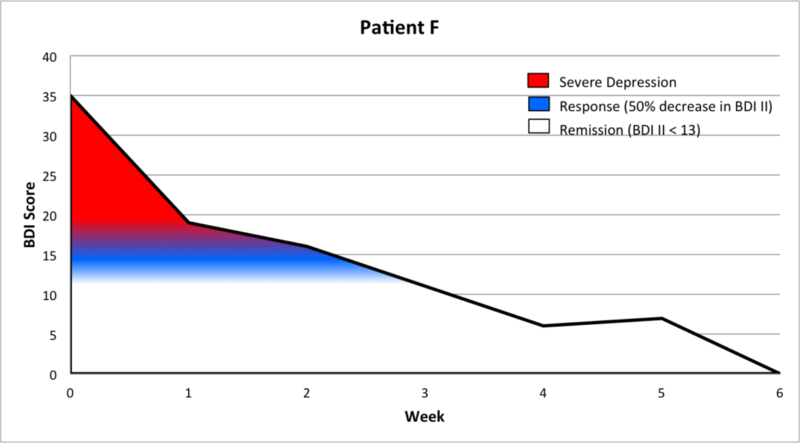 After this course of TMS treatment, patient is in full remission with a 28 point drop from his baseline BDI II score. A 62 year-old male who suffered from depression for 5 years. After failing numerous medication trials and refusing electroconvulsive therapy, he was referred to Dr. Stubbeman for TMS treatment. He started out with a baseline BDI II score of 44. 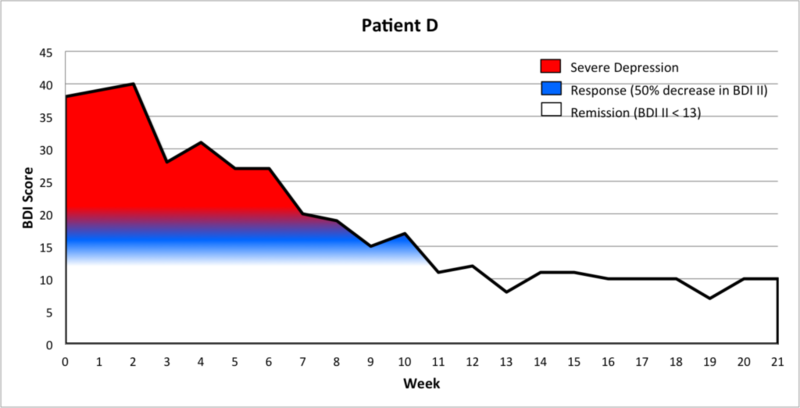 Patient is now living a happy life in full remission with a BDI II of 9, marking a 35 point total drop in his scale score. A 20 year-old male who had been depressed for six years. Over the last year prior to TMS treatment, his depression had severely negatively impacted all areas of his life. His baseline BDI II score was 30. His BDI II score had dropped to 0 by the completion of treatment, and he has maintained remission to date. A 20 year-old male with Major Depression and purely obsessional Obsessive Compulsive Disorder (OCD). 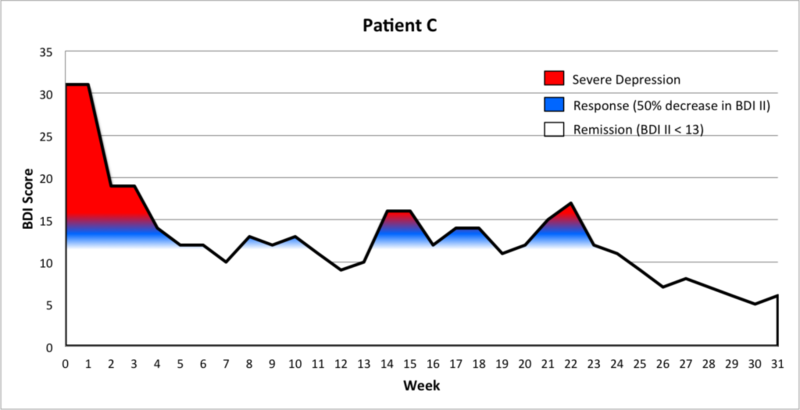 After being treated with TMS, patient’s obsessional OCD remitted along with his mood following treatment. 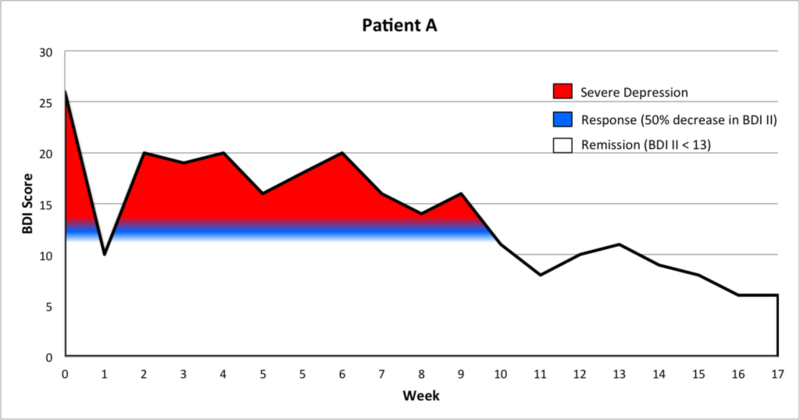 Patient originally could not function at school, but is currently excelling in academic program and remains in remission as of six month follow up. A 52-year old male who suffered from Bipolar I Disorder for 3 years and had failed to improve his depressive symptoms with medication. He began treatment with a baseline BDI-II score of 35. After an 8-week treatment course, his score had fallen 31 points to a final BDI-II of 4. The patient has remained in remission as of his 3-month follow-up. A 50-year old female who suffered from major depressive disorder (MDD) for 13 years. On four separate occasions, she attempted to taper off of her antidepressants, but was unsuccessful. She was referred to Dr. Stubbeman with an initial BDI-II of 41. After 9 weeks of treatment, she reached remission and was then able to successfully taper off of her antidepressants. She finished the treatment course with a BDI-II of 2. Or, fill out our form and get help now. TMS could work for you, let us help you. Contact us today.